CEO Retreats are an opportunity for leaders to get away from the pressure of their day to day work and envision a new future for their impact and for their organization. CEO Retreats are a critical balance of time building relationships with other powerful leaders, content to help you become a more future focused leader, and time to think about how to apply what you are learning to your life and to your organization. CEO Retreats are open to leaders from corporations, foundations, nonprofits, government agencies, and entrepreneurs that run their own businesses. Due to limited space and the collaborative nature of a mastermind experience, participants are selected through an application process. This carefully curated group will become a supportive mastermind to help take your leadership to the next level. This retreat is open to leaders from foundation, nonprofits, government, and business. Retreats fill up quickly so fill out your application soon to get priority consideration. How long have you led your organization? Spaces are not held until a $1,000 deposit has been submitted. Final payments are due January 15, 2019. Deposits are refundable through December 15, 2018, after that you may transfer your deposit to another FutureGood Retreat. Not sure if the CEO Mastermind & Retreat is right for you? Schedule a call to talk with Trista and learn more https://calendly.com/tristaharris/30-minute-call/. Due to limited space and high interest, participants in the CEO of Color Mastermind Retreat are selected through an application process. This carefully curated group will become a supportive mastermind to help take your leadership to the next level. Retreats fill up quickly so fill out your application soon to get priority consideration. Spaces are not held until a $1,000 deposit has been submitted. Final payments are due December 15, 2018. Deposits are refundable through November 15, 2018, after that you may transfer your deposit to another FutureGood Retreat. 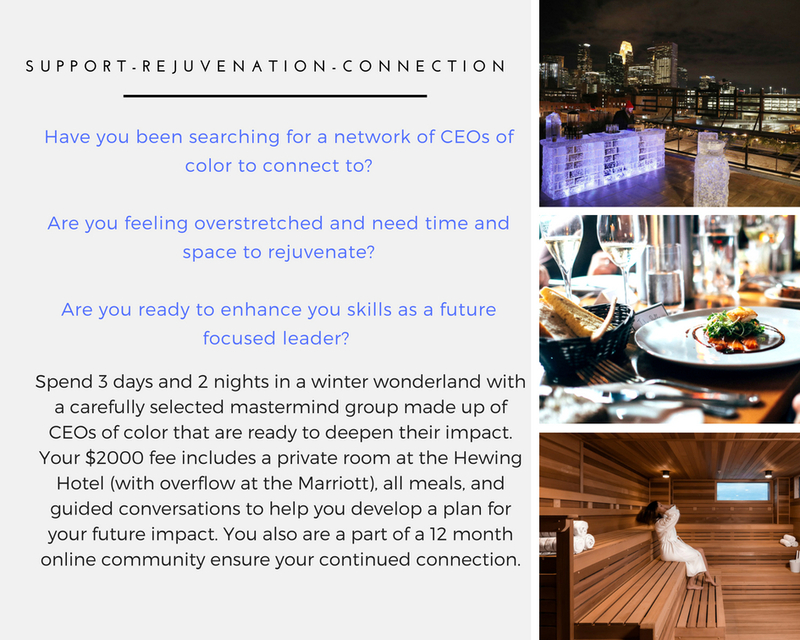 Not sure if the CEO of Color Retreat is right for you? Schedule a call with Trista to learn more https://calendly.com/tristaharris/30-minute-call/.